Jumia Mobile week deals are live! Jumia Africa’s leading online shop has today started the much anticipated Jumia Mobile Week . With discounts up to 60% OFF on Tecno, iPhone, Samsung, Infinix, Nokia, Huawei, HTC, Redmi and many more, this is easily the biggest mobile campaign Uganda has ever had. Some of the most anticipated deals that no one should miss out on include the Iphone 7 discounted from 2,400,000 to 1,599,000 Ugx, Nokia 6.1 from 1,070,000 to 567,000 Ugx, Infinix Zero 6 Pro X620 from 1,560,000 to 1,099,000 Ugx, Samsung Galaxy J6 from 920,000 to 580,000 Ugx, Tecno Camon 11 Pro from 900,000 to 763,000 Ugx, power bank from 80,000 to 50,000 Ugx and the cheapest smartphone in Uganda at 115,000 Ugx. Mr. Ron Kawamara, CEO Jumia Uganda, said that the campaign is of major importance to jumia because being an online company we have taken on the mantle of pushing mobile penetration in Uganda. E-commerce is not for the future but for now and affordability of smartphones is one of the two main factors to improve the digital industry in Uganda with affordability of Internet being the second. He also added that the exciting flash sales and treasure hunts are back and bigger, with items like the Iphone XR at 2,299,000 Ugx from 3,000,000 Ugx already sold out during the midnight Flash sale and many more like the huawei mate-8 from 1,700,000 to 1,000,000 Ugx yet to come at different intervals of the mobile week campaign which runs from 8th until the 21st of April plus the Iphone 7 at only 1,000 Ugx and many more as a treasure hunts highly anticipated to come. Ugandans can now enjoy the biggest smartphone sale ever had in the country. Mr Kawamara noted that if you place an order for an item marked Jumia express before 3 PM, it will be delivered on the same day or within 24 hours and also with the Jumia partnership with Liberty insurance customers can now enjoy the most affordable insurance on all the mobile items they purchase off Jumia, with Insurance starting at only 5,000 Ugx depending on the mobile item ordered and covering aspects such as theft and damage customers are going to enjoy value for money as this is added to the 7 day return policy guarantee from Jumia plus warranty of the different items. 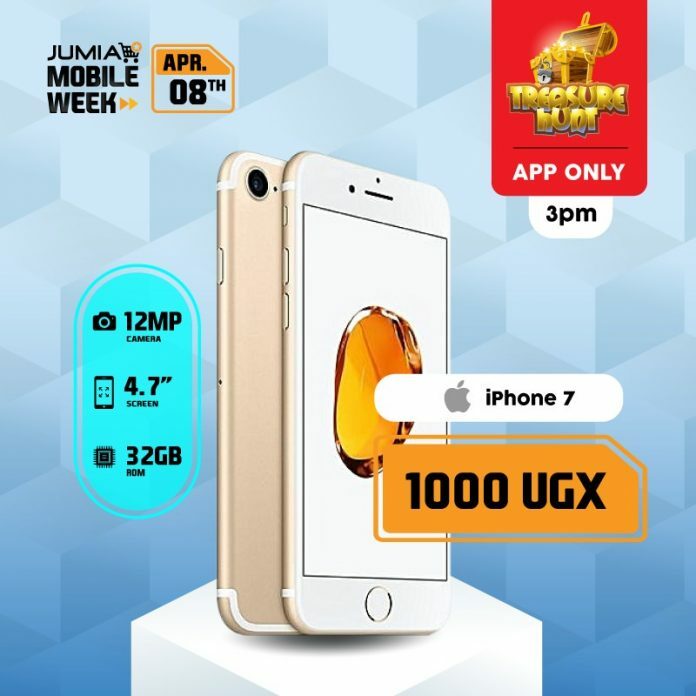 Visitors to the site www.jumia.ug , free Jumia app and to the Jumia mobile app will have an opportunity to claim the biggest discounts on thousands of Mobile related items.